The Wind That Shakes the Barley is a 2006 war drama film directed by Ken Loach, set during the Irish War of Independence (1919–1921) and the Irish Civil War (1922–1923). Written by long-time Loach collaborator Paul Laverty, this drama tells the fictional story of two County Cork brothers, Damien O'Donovan (Cillian Murphy) and Teddy O'Donovan (Pádraic Delaney), who join the Irish Republican Army to fight for Irish independence from the United Kingdom. 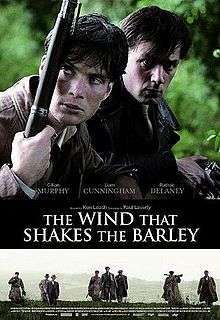 The film takes its title from the Robert Dwyer Joyce's "The Wind That Shakes the Barley", a song set during the 1798 rebellion in Ireland and featured early in the film. The film is heavily influenced by Walter Macken's 1964 novel The Scorching Wind. Widely praised, the film won the Palme d'Or at the 2006 Cannes Film Festival. Loach's biggest box office success to date, the film did well around the world and set a record in Ireland as the highest-grossing Irish-made independent film ever, until surpassed by The Guard. County Cork, Ireland, 1920. Dr. Damien O'Donovan is about to leave his native village to practise medicine in a London hospital. Meanwhile, his brother Teddy commands the local flying column of the Irish Republican Army. After a hurling match, Damien witnesses the summary execution of his friend, Micheál Ó Súilleabháin, by British Black and Tans. Although shaken, Damien rebuffs his friends' entreaties to stay in Ireland and join the IRA, saying that the war is unwinnable. As he is leaving town, Damien witnesses the British Army vainly trying to intimidate a railway personnel for refusing to permit the troops to board. In response, Damien decides to stay and is sworn into Teddy's IRA brigade. After drilling in the mountains, the column raids the village's Royal Irish Constabulary barracks to acquire revolvers, then uses them to assassinate four Auxiliaries. In the aftermath, Anglo-Irish landowner Sir John Hamilton coerces one of his servants, IRA member Chris Reilly, into passing information to the British Army's Intelligence Corps. As a result, the entire brigade is arrested. In their cell, Damien meets the train driver, Dan, a union official who shares Damien's socialist views. Meanwhile, British officers interrogate Teddy, pulling out his fingernails when he refuses to give them the names of IRA members. Johnny Gogan, a British soldier of Irish descent, helps all but three of the prisoners escape. After the actions of Sir John and Chris are revealed to the IRA's intelligence network, both are taken hostage. As Teddy is still recovering, Damien is temporarily placed in command. News arrives that the three remaining IRA prisoners have been tortured and shot. Simultaneously, the brigade receives orders to "execute the spies". Despite the fact that Chris is a lifelong friend, Damien shoots both him and Sir John. Later, the IRA ambushes and wipes out a convoy of the Auxiliary Division, and in retaliation another detachment of Auxiliaries loots and burns the farmhouse of Damien's sweetheart, Cumann na mBan member Sinéad Sullivan. Sinéad is held at gunpoint while her head is shaved dry, cutting her scalp. Later, as Damien treats her, a messenger arrives with news of a formal ceasefire between Britain and the IRA. After the Anglo-Irish Treaty is signed, the brigade learns that a partitioned Ireland will only be granted Dominion status within the British Empire. As a result, the brigade divides over accepting the terms of the Treaty. Teddy and his allies argue that accepting the Treaty will bring peace now while further gains can be made later. Others oppose the Treaty, proposing to continue fighting until a united Irish Republic can be obtained. Dan and Damien further demand the collectivisation of industry and agriculture. Any other course, declares Dan, will change only "the accents of the powerful and the colour of the flag". Soon the Irish Free State replaces British rule, and Teddy and his allies begin patrolling in Irish Army uniforms. Meanwhile, Damien and his allies join the Anti-Treaty IRA. When the Battle of Dublin launches the Irish Civil War, the Anti-Treaty column commences guerrilla warfare against Free State forces. As the violence escalates, Teddy expresses fear that the British will invade if the republicans gain the upper hand. His position is: "They take one out, we take one back. To hell with the courts." Soon after, Dan is killed and Damien is captured during a raid for arms on an Irish Army barracks commanded by Teddy. Sentenced to death, Damien is held in the same cell where the British Army imprisoned them earlier. Desperate to avoid executing his brother, Teddy pleads with Damien to reveal where the Anti-Treaty IRA is hiding the stolen rifles. In return, Teddy offers Damien full amnesty, a life with Sinéad, and the vision of an Ireland where Pro- and Anti-Treaty Irishmen can raise families side by side. Insulted , Damien responds by saying that he will never "sell out" the Republic the way Chris Reilly did and Teddy leaves the cell in tears. Damien writes a goodbye letter to Sinéad, expressing his love for her, but he says that he knows what he stands for and is not afraid. At dawn, Damien dies before a firing squad commanded by a heartbroken Teddy. Teddy delivers Damien's letter to Sinéad who is distraught and heartbroken. She attacks Teddy and orders him to leave her land. The film stars mostly Irish actors and was made by British director Ken Loach. It is an international co-production between companies in Ireland, United Kingdom, Germany, Italy, Spain, France, Belgium, and Switzerland. The title derives from the song of the same name, The Wind That Shakes the Barley, by 19th-century author Robert Dwyer Joyce. The song made the phrase "the wind that shakes the barley" a motif in Irish republican song and poetry. Loach took some of the inspiration for Damian's character from the memoirs of republican leader Ernie O'Malley. University College Cork historian Donal O Drisceoil was Loach's historical adviser on the film. The film was shot in various towns within County Cork during 2005, including Ballyvourney and Timoleague. Some filming took place in Bandon, County Cork: a scene was shot along North Main Street and outside a building next to the Court House. The ambush scene was shot on the mountains around Ballyvourney while the farmhouse scenes were filmed in Coolea. Damien's execution scene was shot at Kilmainham Gaol in Dublin, where many leaders of Irish rebellions were imprisoned and some executed by the British and latterly in 1923 by the Irish Free State. Many of the extras in the film were drawn from local Scout groups, including Bandon, Togher and Macroom with veteran Scouter Martin Thompson in an important role. Many of the British soldiers seen in the film were played by members of the Irish Army Reserve, from local units. Among the songs on the film's soundtrack is Óró sé do bheatha abhaile, a 17th-century Irish Jacobite song whose lyrics the nationalist leader Pádraig Pearse changed to focus upon republican themes. The commercial interest expressed in the UK was initially much lower than in other European countries and only 30 prints of the film were planned for distribution in Great Britain, compared with 300 in France. However, after the Palme d'Or award the film appeared on 105 screens across Britain and Northern Ireland. The Respect Party, of which Ken Loach is on the national council, called for people to watch the film on its first weekend in order to persuade the film industry to show the film in more cinemas. Every time a colony wants independence, the questions on the agenda are: a) how do you get the imperialists out, and b) what kind of society do you build? There are usually the bourgeois nationalists who say, 'Let's just change the flag and keep everything as it was.' Then there are the revolutionaries who say, 'Let's change the property laws.' It's always a critical moment. It's about the civil war in microcosm... It's not a story like Michael Collins. It's not seeking that sort of biographical accuracy, but rather will express the themes of the period. This is the core of the later Troubles, which is why it's so fascinating to make. The movie became the most popular independent Irish film ever released in Ireland, earning €377,000 in its opening weekend and €2.7 million by August 2006. The Daily Telegraph's film critic described it as a "brave, gripping drama" and said that director Loach was "part of a noble and very English tradition of dissent". A Times film critic said that the film showed Loach "at his creative and inflammatory best", and rated it as 4 out of 5. The Daily Record of Scotland gave it a positive review (4 out of 5), describing it as "a dramatic, thought-provoking, gripping tale that, at the very least, encourages audiences to question what has been passed down in dusty history books." Jim Emerson, Roger Ebert's editor, gave the film a 4 star review, calling it "breathtakingly authentic", and declared it ranked "among the best war films ever made." The film was attacked by some commentators including Simon Heffer. Following the Cannes prize announcement, Unionist historian Ruth Dudley Edwards wrote in the Daily Mail on 30 May 2006 that Loach's political viewpoint "requires the portrayal of the British as sadists and the Irish as romantic, idealistic resistance fighters who take to violence only because there is no other self-respecting course," and attacked his career in an article that Loach criticised as inaccurate. The following week, Edwards continued her attack in The Guardian, admitting that her first article was written without seeing the film (which at that stage had only been shown at Cannes), and asserting that she would never see it "because I can't stand its sheer predictability." One day after Edwards' initial article appeared, Tim Luckhurst of The Times called the film a "poisonously anti-British corruption of the history of the war of Irish independence" and compared Loach to Nazi propagandist director Leni Riefenstahl. Yet George Monbiot revealed on 6 June, also in The Guardian, that the production company had no record of Luckhurst having attended a critics' screening of the as-yet unreleased film, and Luckhurst refused to comment. In a generally positive review, the Irish historian Brian Hanley suggested that the film might have dealt with the IRA's relationship with the Protestant community, as one scene in its screenplay did. ↑ "THE WIND THAT SHAKES THE BARLEY". bbfc.co.uk. ↑ "Festival de Cannes: The Wind That Shakes the Barley". festival-cannes.com. Retrieved 13 December 2009. ↑ Smith, Damon (18 March 2007). "The agitator". The Boston Globe. 1 2 "Filming Locations". IMDb. Retrieved 23 November 2008. ↑ "Kilmainham Gaol". goireland.com. Retrieved 23 November 2008. ↑ "Archived copy". Archived from the original on 6 February 2007. Retrieved 2006-09-11. ↑ "Archived copy". Archived from the original on 15 November 2008. Retrieved 2009-02-19. ↑ "'The Wind That Shakes The Barley' set visit". TimeOut. 18 July 2005. ↑ Loach film breaks Irish box-office records Kerr, Aine. The Irish Times (1921–Current File) [Dublin, Ireland] 8 August 2006: 3. ↑ "The Wind That Shakes the Barley – Rotten Tomatoes". Rotten Tomatoes. Retrieved 5 January 2008. ↑ "Wind That Shakes the Barley, The (2007): Reviews". Metacritic. Retrieved 5 January 2008. 1 2 "Metacritic: 2007 Film Critic Top Ten Lists". Metacritic. Archived from the original on 2 January 2008. Retrieved 5 January 2008. ↑ Ebert, Roger (April 2007). "The Wind that Shakes the Barley". rogerebert.com. Retrieved 5 June 2011. ↑ "Film Eye: The Wind that Shakes the Barley/ Reviews/Issue 5 (Sep/Oct 2006)/Volume 14". Historyireland.com. Retrieved 19 February 2013. ↑ "Sectarian Wind Up – a defence of The Wind that Shakes the Barley". Cork Examiner. 26 June 2006.